Preheat oven to 175 degrees and set an oven rack to the middle position. Peel and cut fruit and sweet potato into 1-inch pieces, approximately 4 cups total. Put fruit and sweet potato into a microwaveable bowl, and microwave on high approximately 8 minutes or until everything is soft and tender. Transfer contents to the bowl of a food processor fitted with the chopping blade. Add maple syrup and pumpkin pie spice and puree mixture until completely smooth. Pour mixture onto the Silpat and using a regular or offset spatula, spread mixture out to the edges until evenly thin and smooth. 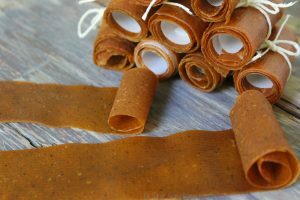 Bake on a middle oven rack for 4-5 hours, until fruit leather is firm to the touch and pulls away from the baking mat easily. Let cool completely, and cut into even strips. Store extra strips rolled up in an airtight bag or container.